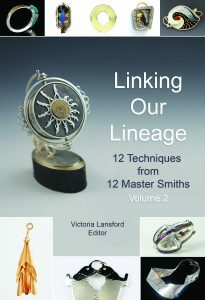 Linking Our Lineage, Volume 2 is an ebook of jewelry and metalsmithing techniques with chapters by Linda Threadgill, Sessin Durgham, Charles Pinckney, Deanna Pastel, Jennifer Jordan Park, James Binnion, Ezra Satok-Wolman, John Lunn, Ken Bova, Sarah Michaela Sitarz, Parker Brown, Tina Wiltsie, and edited by Victoria Lansford. The processes illustrated range from beginning to advanced and are presented with over 190 color photographs and 3 videos. The links created and written about by each artist were part of the 2016 SNAG Links project, a fundraiser for SNAG. All proceeds from the book benefit SNAG.